Glyde Two-Handle High Arc Bathroom Faucet in Chrome (Valve Sold Separately) Elegantly simple, the Glyde collection's graceful curves and contours flow as beautifully as the faucet's water stream, creating a transitional style that spans a variety of decorating trends. Glyde Two-Handle High Arc Bathroom Faucet in Chrome (Valve Sold Separately) is rated 4.8 out of 5 by 6. Rated 5 out of 5 by Kay from This is a very nice faucet. I bought 2 of... This is a very nice faucet. I bought 2 of them for my master bath. They look very nice. I love the high arc of the faucets. This a great look for my new bathroom counter top. Rated 5 out of 5 by Domantn from Moen is the best and most reliable faucet I have found and I won't purchase anything else. But I... Moen is the best and most reliable faucet I have found and I won't purchase anything else. But I have to say that the description on the HD website leaves a whole lot to be desired. Unlike the cheaper brands, this set doesn't include the valve and connection part of the installation which has to be purchased separately. I didn't realize that until I got the faucet. So then I had to order the "valve kit" which would be better described as the "faucet installation kit". It would also be helpful if the description on the faucet indicated that a separate installation kit was required. It referred to a valve installation which I took to mean the shut off valve from the hot and cold supply lines. All that said, like a typical Moen it installed quickly and easily and works and looks great. Mamas happy and that's what matters. Rated 5 out of 5 by Phil from Looks great. Fits just right.. Looks great. Fits just right.. Rated 5 out of 5 by Charlene from My plumber installed this faucet. It is beautiful. It works... My plumber installed this faucet. It is beautiful. It works smoothly and there is no excess splash. I am very happy with my choice. The high arc faucet should be easily reached by anyone with a disability. Rated 5 out of 5 by zuidy from After finding out the original faucet I wanted was going to be delayed for 3 months, I stumbled u... After finding out the original faucet I wanted was going to be delayed for 3 months, I stumbled upon this beautiful replacement. I installed this myself and it was pretty easy but one thing I didn't realize is that it's not a complete package. It required the "rough in" to be installed prior to attaching the handles and faucet. It was my own rookie mistake, since I had never installed a wide set faucet in the past. One of the things I look for in a faucet is how easy it is to keep clean and free of water marks. This faucet fit the bill, it's beautiful and water never pools on the handles! 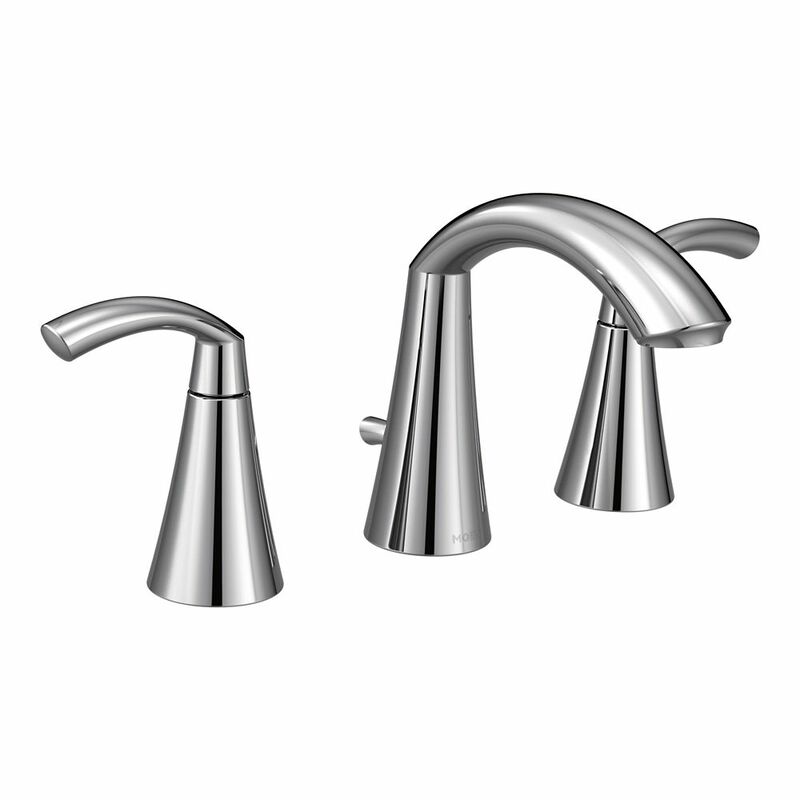 Rated 4 out of 5 by KK from Sleek faucet trim This is a sleek heavy faucet from Moen. I got it on sale so the price was great. It has a long spout reach which we were looking for. However, what is not clear is that the water drops straight drown from the spout and isn't angled like most faucets. This caused us to not achieve the spout reach into the sink we would have liked. However, look wise and quality wise, it's a great faucet. Goes with the Moen 9000 rough in. Easy install.